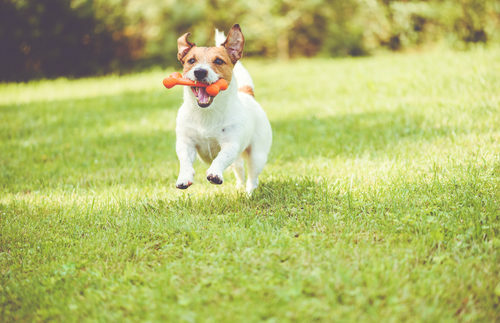 The Woodlands is well known as a dog-friendly community boasting several fenced-in, off-leash dog parks to bring your four-footed friend to for some exercise and a dog-gone good time! These “Bark Parks” as they are affectionately called, are specially designated and designed for Man’s Best Friend to run free. Each park includes water sources and separate enclosures for both big dogs and smaller dogs. Dogs are required to be up-to-date with their shots and owners should carry papers (just in case) while visiting. There are also Dog Park Rules to follow, so make sure you are a responsible pet owner and review these guidelines before visiting. Hours are from dawn to dusk. Bear Branch Dog Park, located off Research Forest Drive, is The Woodlands’ largest dog park with more than two acres of land to give your canine companion plenty of room to run and romp with others. The park offers plenty of shaded areas to cool off, including a covered pavilion. Several benches are conveniently located throughout the park for owners who just want to sit back and watch the fun! The park is divided into two sections: a large dog section (for dogs over 25 lbs) and a small dog section (for dogs 25 lbs. and under). Water is available in both sections along with a water “play station,” dog waste bags and waste containers to keep the park clean. There is also ample parking on site. Cattail Dog Park, nestled off of Cochran’s Crossing Drive, is approximately one acre in size. This popular fenced-in dog park has both a large dog section (for dogs over 25 lbs.) and a small dog section (for dogs 25 lbs. and under). There are water spigots and doggie showers on site, but guests are encouraged to bring their own drinking containers for their dog(s). Visitors will find numerous dogipot waste containers throughout the park and convenient parking. Located in the front of The Woodlands, Tamarac Park’s “Dog Friendly” area is The Woodlands’ newest dog park. The area is quite spacious, with more than an acre of space for dogs to run, and is very well shaded with large, mature trees. There are several benches to sit on throughout the park and of course, a water source for our thirsty companions. This park is tailor-made for the little guys – those 25 lbs. and under. There is only a small area set aside for dogs at Terramont Park, making it a perfect area for those smaller breeds such as Yorkies, Chihuahuas and Shih Tzu’s. No big dogs allowed!